The context of the image for those not familiar with it is this image about noSQL databases. This triggered a bunch of discussion, with multiple people saying "so how would *you* do it", and we'll get to that (or for the TL;DR skip to the bottom), but first some background. The tweet is a reference to the BGP protocol the Internet uses to exchange routing data between (and within) networks. This protocol (unless inside a separate container) is never encrypted, and can only be authenticated (in practice) by a TCP option known as TCP-MD5 (standardised in RFC2385). The BGP protocol itself has no native encryption or authentication support. Since routing data can often be inferred by the packets going across a link anyway, this has lead to this not being a priority to fix. Transport authentication & encryption is a distinct issue from validation of the routing data transported by BGP, an area already being worked on by the various RPKI projects, eventually transport authentication may be able to benefit from some of the work done by those groups. TCP-MD5 is quite limited, and while generally supported by all major BGP implementations it has one major limitation that makes it particularly annoying, in that it takes a single key, making key migration difficult (and in many otherwise sensible topologies, impossible without impact). Being a TCP option is also a pain, increasing fragility. At the time of its introduction TCP-MD5 gave two main benefits the first was to have some basic authentication beyond the basic protocol (for which the closest element in the protocol is the validation of peer-as in the OPEN message, and a mismatch will helpfully tell you who the far side was looking for), plus making it harder to interfere with the TCP session, which on many of the TCP implementations of the day was easier than it should have been. Time, however has marched on, and protection against session interference from non-MITM is no longer needed, the major silent MITM case of Internet Exchanges using hubs is long obsolete, plus, in part due to the pain associated in changing keys many networks have a "default" key they will use when turning up a peering session, these keys are often so well known for major networks that they've often been shared on public mailing lists, eliminating what little security benefit TCP-MD5 still brings. This has been known to be a problem for many years, and the proposed replacement TCP-AO (The TCP Authentication Option) was standardised in 2010 as RFC5925, however, to the best of my knowledge eight years later no mainstream BGP implementation supports it, and as it too is a TCP option, not only does it still has many of the downsides of MD5, but major OS kernels are much less likely to implement new ones (indeed, an OS TCP maintainer commenting such on the thread I mentioned above is what kicked off my thinking). TCP, the wire format, is in practice unchangeable. This is one of the major reasons for QUIC, the TCP replacement protocol soon to be standardised as HTTP/3, so for universal deployment any proposal that requires changes to TCP is a non-starter. Any solution must be implementable & deployable. Implementable - BGP implementations must be able to implement it, and do so correctly, ideally with a minimum of effort. Ideally any security-critical code should already exist in a standardised form, with multiple widely-used implementations. Fortunately for us, that exists in the form of TLS. 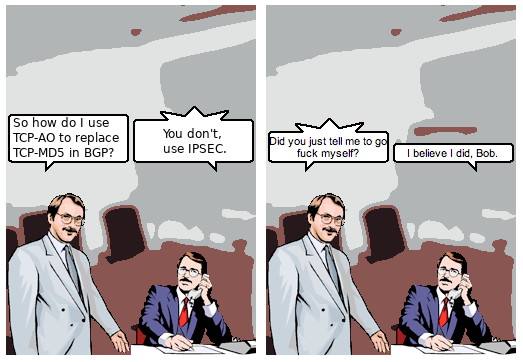 IPSEC, while it exists, fails the deployable tests, as almost anyone who's ever had the misfortune of trying to get IPSEC working between different organisations using different implementations can attest, sure it can usually be made to work, but nowhere near as easily as TLS. Discussions about the use of TLS for this purpose have happened before, but always quickly run into the problem of how certificates for this should be managed, and that is still an open problem, potentially the work on RPKI may eventually provide a solution here, but until that time we have a workable alternative in the form of TLS-PSK (first standardised in RFC4279), a set of TLS modes that allow the use of pre-shared keys instead of certificates (for those wondering, not only does this still exist in TLS1.3 it's in a better form). For a variety of reasons, not the least the lack of real-time clocks in many routers that may not be able to reach an NTP server until BGP is established, PSK modes are still more deployable than certificate verification today. One key benefit for TLS-PSK is it supports multiple keys to allow migration to a new key in a significantly less impactful manner. The most obvious way to support BGP-in-TLS would simply be to listen on a new port (as is done for HTTPS for example), however there's a few reasons why I don't think such a method is deployable for BGP, primarily due to the need to update control-plane ACLs, a task that in large networks is often distant from the folk working with BGP, and in small networks may not be understood by any current staff (a situation not dissimilar to the state of TCP). Another option would simply be to use protocol multiplexing and do a TLS negotiation if a TLS hello is received, or unencrypted BGP for a BGP OPEN, this would violate the general "principal of least astonishment", and would be harder for operators to debug. Instead I propose a design similar to that used by SMTP (where it is known as STARTTLS), during early protocol negotiation support for TLS is signalled using a zero-length capability in the BGP OPEN, the endpoints do a TLS negotiation, and then the base protocol continues inside the new TLS tunnel. Since this negotiation happens during the BGP OPEN, it does mean that other data included in the OPEN leaks. Primarily this is the ASN, but also the various other capabilities supported by the implementation (which could identify the implementation), I suggest that if TLS is required information in the initial OPEN not be validated, and standard reserved ASN be sent instead, and any other capabilities not strictly required not sent, with a fresh OPEN containing all normal information sent inside the TLS session. Migration from TCP-MD5 is key point, however not one I can find any good answer for. Some implementations already allow TCP-MD5 to be optional, and that would allow an easy upgrade, however such support is rare, and unlikely to be more widely supported. On that topic, allowing TLS to be optional in a consistent manner is particularly helpful, and something that I believe SHOULD be supported to allow cases like currently unauthenticated public peering sessions to be migrated to TLS with minimal impact. Allowing this does open the possibility of a downgrade attack, and make more plausible attacks causing state machine confusions (implementation believes it's talking on a TLS-secured session when it isn't). What do we lose from TCP-MD5? Some performance, whilst this is not likely to be an issue for most situations, it is likely not an option for anyone still trying to run IPv4 full tables on a Cisco Catalyst 6500 with Sup720. We do also lose the TCP manipulation prevention aspects, however these days those are (IMO) of minimal value in practice. There's also the costs of implementations needing to include a TLS implementations, and whilst nearly every system will have one (at the very least for SSH) it may not already be linked to the routing protocol implementation. Lastly, my apologies to anyone who has proposed this before, but my neither I nor my early reviewers were aware of such a proposal. Should such a proposal already exist, meeting the goals of implementable & deployable it may be sensible to pick that up instead. Two BGP implementations, not derived from the same source. Using two TLS implementations, not derived from the same source. To make this deployable TLS-PSK MUST be supported, although exact configuration is TBD. Authentication-only variants of TLS (ex RFC4785) REALLY SHOULD NOT be supported. Standard certificate-based verification MAY be supported, and if supported MUST validate use client certificates, validating both. However, how roots of trust would work for this has not been investigated. Yes this means also sending 4-byte capability. Every implementation that might possibly implement this already supports 4-byte ASNs. The key words "MUST (BUT WE KNOW YOU WON'T)", "SHOULD CONSIDER", "REALLY SHOULD NOT", "OUGHT TO", "WOULD PROBABLY", "MAY WISH TO", "COULD", "POSSIBLE", and "MIGHT" in this document are to be interpreted as described in RFC 6919.